The Betting Rant is run by Matt Houghton (Matthew) There are a number of different websites and news letters online all of which pertain to the notion of betting in some way or another. You are reading this on one now in fact. There are also a number of different personalities that crop up, all claiming some degree of celebrity in these circles. Each putting forward their views and opinions, sometimes respectfully, sometimes aggressively (which is often downplayed as the oft miscategorised “banter”). The Betting Rant is one of the more publicised news letter for those that are interested in betting, but does this necessarily equate to one of the best? Is it even any good? This is an important question as any gambler will tell you that following bad advice can be a costly mistake in the long term. If I am honest, this is a hell of a question to tackle and one that if you wish to really get to the bottom of, requires a lot of thought and consideration. As a newsletter, I personally find that The Betting Rant is rather lacking. Whilst it does cover topics related to betting, these are mostly related to the various products that Matt Houghton produces and sells. I have looked at these before and I will no doubt go into some more detail over the course of this article, but there are plenty of services that are on offer. This is in no small part down to the fact that Matt Houghton appears to be a betting expert on every sport that he touches. I have seen emails from him claiming that his expertise covers such wide ranging sport as horse racing and football to women’s tennis and snooker. Whilst one supposes that it is possible for somebody to truly be an expert on such a variety of sports, it would definitely take a lot of work. Factor into this running the The Betting Rant website and newsletter, and I would hate to see what Matt Houghton’s calendar looks like. This is rather interesting given the fact that a lot of the products that are sold through The Betting Rant all have implications about how much freedom Matt Houghton has in his life. I could of course be wrong and Matt Houghton may genuinely be as free as he claims, but I know how hard it is to keep a website updated with fresh and original content. 1 What is The Betting Rant? 3 Who is Matt Houghton? 5 Why The Need For Such Nastiness to Customers? 7 Who are Miles Tredwell and Karl Zanft? 8 Questionable Tipsters Connected with Matt Houghton? 9 Who are Agora Lifestyles? 10 What Products do The Betting Rant Offer? 12 So is The Betting Rant any Good? 13 Is Matt Houghton Honest? So, as I’ve touched upon, there are two main aspects to The Betting Rant as a product, although really both of these are only there to serve a third purpose, selling products. The first thing that I will look at is the newsletter. Now, this is something that is generally sent out daily and talks about the various life experiences that Matt Houghton has encountered surrounding betting. It also looks at the things that he has been up to such as attending seminars etc. There are also the occasional “advertising features”. These are adverts for products that Matt Houghton has presumably been paid to market and are for a massive range of products and product types. For example, earlier in November, The Betting Rant email that was sent out was just a giant advert for a product called Lotto Plus, a rather questionable lottery website offering cheap lotto tickets. It is interesting that The Betting Rant was used as a marketing platform for this, as any sensible gambler who works based off numbers will tell you that the Lotto is a dubious at best method of making money (a tone that Matt Houghton seems to have shared saying in a recent article that the lottery requires no skill). So the online newsletter is somewhat informative, but ultimately, is nothing more than a marketing tool. Those who are looking for actual information on betting may well want to look elsewhere. To be fair to Matt Houghton though, there have recently been some interesting titbits and insight into the world of betting. These have however been ‘given away’ for free on the grounds that it’s Christmas so expect more of the usual over the rest of the 11 months of the year. Let us now turn to the website. This is the proverbial meat and veg of The Betting Rant and is mostly composed of a series of blog like posts. These do somewhat increase in quality compared to the newsletter, however there are some posts that simply mirror what is sent out which makes checking the website a sometimes rather infuriating waste of time. Of course, all of this pales to the main purpose of The Betting Rant which is to sell products and Matt Houghton has more than his fair share of them, and has also HAD more than his fair share. In fact, since 2011, he has been involved in the release of at least 14 different products, all at various price points. Of those 14, there are only a small handful that remain currently available and at least one of these has undergone some rather substantial changes as a result of staff changes. In terms of the services that are currently marketed, the majority of these are operated by Matt Houghton and are predominantly based around football or horse racing. These range from self selection betting systems to tipster services, however I find it most telling to note that the majority appear to have been quietly closed (often to outrage and a not necessarily very productive response from the creator). It is interesting to note that whilst The Betting Rant is operated on a day to day basis by Matt Houghton, the website is actually owned by Agora Lifestyles. A large publishing house that specialises in business opportunities and the like (I will look at them in greater detail below). At risk of going somewhat off topic here and risking the wrath of commenters, I feel that I have to address the concept of “banter” to provide some context for my opinions on Matt Houghton and The Betting Rant. Banter, by definition, is “the playful and friendly exchange of teasing remarks”. This means that for banter to really stand up, it should be amongst friends. This is all well and good down the pub or in a betting shop, but when a service provider starts engaging in “banter” with strangers, the term simply doesn’t apply. Imagine a person going bankrupt and Wonga responding with “You lost your money because you mismanaged your finances. We make loads of money so you were doing something wrong, not us!”. Who is at fault? The person charging 4,000% APR or the person who put their trust in the company in the first place? This is all very important as Matt Houghton often refers to some of his more disparaging comments as “banter”. Obviously what one person considers insulting another may find funny and that is the nature of humour, but when it comes to a professional setting it just doesn’t work that way. And, again, something that people may disagree with me on, the comments section of a review of your product is to me a professional setting. Quite who Matt Houghton is seems to differ massively depending on where you are looking and who he is dealing with. Fundamentally (and beyond question), he is the creator and editor of The Betting Rant. He is also a clever and capable internet marketer as is evidenced by the “successes” of his various products. To some people however, there is a much more aggressive and dismissive side to Matt Houghton and this is something that becomes particularly apparent in comments on his products. In terms of his career in the professional betting scene, Matt Houghton has been active for a number of years with The Betting Rant. It seems that at first The Betting Rant wasn’t quite as geared towards the money making machine that it is now. Matt Houghton would post opinion pieces, general and genuine advice on betting and most importantly, appeared to want to help people to succeed at betting. Over time there has been a clear switch towards a more commercialised operation that is geared to make money. Matt Houghton has however always been engaged with his audience although some people (myself included) feel as though his approach has become less friendly as time has passed. He has seemingly become more argumentative and entrenched in his own ideas about what is or isn’t right. On the rare times when he concedes that somebody may have a point, it is often reinforced with his own view. He plays this off as being somebody who pulls no punches and that if someone get’s “right up [my] nose” that as an The Betting Rant reader you will be the first to know. I will first of all address the content side of things. Matt Houghton has put out some reasonably performing products and several of these remain on sale through The Betting Rant. Unfortunately, everything that I have seen of his products fundamentally point in the same direction. This is namely that they are very expensive and don’t quite deliver on the results that the sales material promises. The response seems to be instead that the service has still made a profit and that should be more than enough. Whilst this is technically true from the point of view of a content creator, there is the often overlooked issue that punters also have a subscription fee to cover before profit. To use one of Matt Houghton’s products, The Syndicate as an example, users would need to make 50 points to £10 stakes before they have covered their subscription fee. This means that when a tipster brags about £1,200 of profit to £10 stakes, to their customers this means just £700. Unfortunately, this is something that Matt Houghton rarely seems to want to acknowledge. What you can take away from this is that Matt Houghton is (depending on which website you look at) a middling to reasonable tipster. His self selection services have seemingly performed slightly better however over throughout my research, there have been strong ups and downs with anything that he has been involved with. Whilst this is inevitable and part of betting, the way that we respond to the downs is much more important than the ups. This brings me onto the next aspect of Matt Houghton. That is, as a person and his interaction with clients. This is one area that seems to be rather worrying. Having looked at his comments not just from his own website, but other review sites, it is clear that if you are in agreement with Matt Houghton or think that his products are infallible, then he is a friendly and appreciative acquaintance who is happy to congratulate users on their successes. If you have not done as well as he believes that you should or could have through his service, and dare to question this, then you can seemingly expect to simply be attacked. This is often hid behind a wall of justification that goes along the lines of I’m your problem, not mine. In fact, he says in one comment to a general thread as a whole that if you can’t handle what he says, then don’t get involved with anything he produces. This was apparently in reply to a female site user who was (justifiably) rather insulted by a tennis tipster service operated by Matt Houghton named “Women Can’t Serve”. Of course, when somebody complains, the fall back position is that all of this is simply tongue in cheek and not to be taken seriously. Unfortunately, this jokey bullying tone is something that I have seen a number of times from Matt Houghton in various comments. For example, there was an exchange on a review site whereby Matt Houghton bragged about one of his services being ranked number one on a certain proofing website since a certain date. Somebody pointed out that there was loss of 6 points to industry SP (albeit with profit to advised stakes and BSP) to which Matt Houghton responded talking about early prices and that this website that he was boasting of having a profit on being unable to proof some of their bets. The user responded pointing out that if the full proofing showed a combined loss before the said date was actually close to 40 points and simply chastised Matt Houghton for trying to misrepresent figures. Something that many people would agree is a reasonable thing to do. In fact, said user said that he wasn’t trying to knock the service but provide a more rounded view. The response from Matt Houghton was to dismiss this user as simply trying to drag down his service and that it is only people who don’t use his products that do this. When somebody backed up the original poster (a content creator who had also had his own products criticised) in saying that it was a misleading comment, the response from Matt Houghton was to simply call them a troll. 4 minutes later once the red mist had seemingly lifted, he replied with rhetoric about long term results, ultimately failing to address the points that users were making. He then goes off on a tangent about how he wouldn’t let somebody like the person who backed up the original criticism near his service. He also says that nobody seems to understand what is important to him or what his job is. Ironically, given his penchant for accusing people of finding conspiracies there are none, he then goes on to level the accusation that people have ulterior motives. This kind of (what I would consider to be) petulance is far from the only example however and I could cite numerous examples of Matt Houghton “going off on one” when somebody criticises his products, services or even him in any way shape or form. Once again, I invite you consider that this is a person who is running a business with subscribers. Why The Need For Such Nastiness to Customers? Even within the comments section on his own products, Matt Houghton appears to continue with his tactic of aggressively smacking down anybody who has a concern. For example, somebody mentions that of 6 tips there was one win which he labelled as odds on and a place. The poster then went on to express the opinion that the rest of the selections were “absolute dross”. 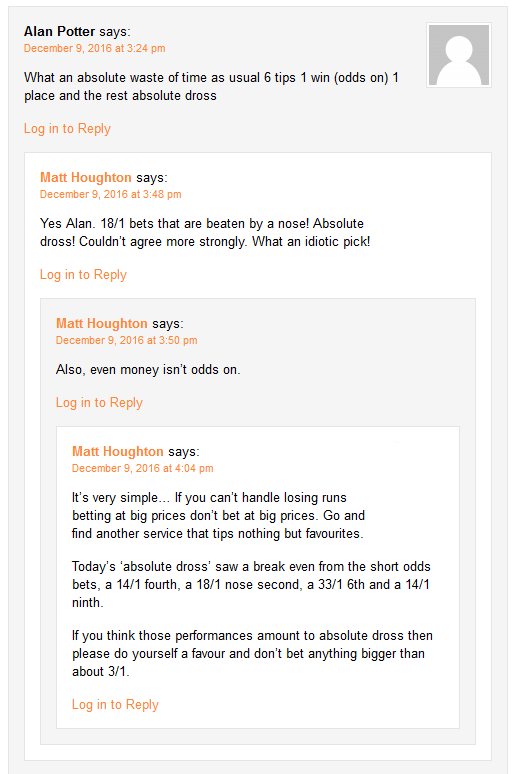 The responses from Matt Houghton were to sarcastically point out that an 18/1 was beaten by a nose before mocking his customers opinion. He then highlights (2 minutes later), with no effort to explain the difference, that the customer had erroneously referred to a bet as odds on rather than even money. An hour later, he goes off on a rant at a paying customer saying that if they can’t handle losing runs then they should go and find a service that tips nothing but favourites. He then lists the positions that the horses finished (seemingly missing the valid point that the tips had still lost out), then suggests that his customer “do himself a favour” and not bet on anything bigger than 3/1. What I find worrying about this is that Matt Houghton seems to approach the situation by chastising his customer rather than trying to offer them help or insight. It seems clear to me that there has been some confusion over the odds, so I would personally be asking that customer if they needed help understanding betting so that they could grow. I certainly wouldn’t tear them apart publicly. Especially not when they are a subscriber to a service that costs £300 per year. There are several other staff listed as working for The Betting Rant aside from Matt Houghton and each of these seems to have a field of expertise. Luke Towler appears to be the one of the more prominent contributors to The Betting Rant and posts weekly with free tips offered on a variety of sports. These predominantly appear to be both rugby and NFL based selections. What is interesting about this is that his own profile says that he is a specialist in F1 and MotoGP (which he really got turned onto once he supposedly realised that there is cash to be made). This information is somewhat conflicted however as the free tips that I have looked at from him appear to be for almost every sport except these. The Grader is listed as a contributor to The Betting Rant however it is worth noting that they haven’t actually contributed anything since 2012. This author supposedly has a background both in sports (specifically rugby league) as well as having worked for a betting shop. Sean Trivass is an occasional contributor to The Betting Rant and he is actually arguably one of the more interesting ones. His articles, whilst infrequent, feature things like stable tours as well as looking at festivals etc. His focus is clearly on horse racing and it would appear that he has a number of contacts in the business that allow him the access that he gets. I would consider his articles to be one of the more unique aspects of The Betting Rant. These are however mostly hidden behind the walls of The Syndicate service meaning that you have to be a member to view them. The final contributor to The Betting Rant is “The Coach”. He was at one point the NFL tipster for The Betting Rant however as with The Grader, he has not updated for a significant period of time. In fact, the last post was from February 2013.
Who are Miles Tredwell and Karl Zanft? I will start by looking at Miles Tredwell as this is seemingly the easier question to answer. According to the sales material for The Syndicate (one of Matt Houghton’s products), he is a specialist in flat racing and at finding mispriced bets. He was also the winner of a competition ran by Matt Houghton that was designed to find the UK’s most profitable undiscovered tipster. The first service that was launched was called Four Factor Racing. This was hugely publicised by The Betting Rant and I don’t doubt that a lot of money was spent promoting the service. Unfortuantely, after 6 months of tipping, it would appear that Miles Tredwell was unable to deliver on his initial promise and Four Factor Racing ended down before apparently being quietly closed (as is seemingly the way with a lot of The Betting Rant products that aren’t defendable). Since then (as mentioned) Miles Tredwell has stayed on in Matt Houghton’s employ and has been providing a number of selections for The Syndicate. By many accounts, these seem to have been performing much better than Matt Houghton’s selections and have eclipsed other contributors and kept the service profitable. Karl Zanft is an interesting contributor to The Betting Rant to look at for two reasons. The first is that when his selections failed to make any profit, he was quietly removed from The Syndicate and all subsequent sales material (I am pretty sure that there is a pattern starting to appear here). In regards to this performance, Karl Zanft’s selections ended up with a loss of 60 plus points which was far from satisfactory. Questionable Tipsters Connected with Matt Houghton? What is interesting about Karl Zanft is that this is far from his first foray into the world of betting. In fact, he had previously been a director of Fineform Racing Limited, a company that placed bets for others. The money was paid into an account by customers, and Karl Zanft would supposedly use this as a betting bank. Unfortunately, Fineform Racing Limited went into liquidation with an estimated deficiency of almost £250,000. It was deemed that proper accounting records weren’t maintained and that it wasn’t possible to determine that the money deposited was actually used for placing bets (the full article can be found here). Matt Houghton was clearly aware of this when he took Karl Zanft on as a tipster as a forum user over at The UK Betting Forum contacted him to confirm that the Karl Zanft attached (at the time) to The Syndicate was the same Karl Zanft who had been disqualified from being a company director. The response received was that he was fully aware of this background saying “As far as I’m concerned his business credentials are irrelevant and although the issues he faced previously were obviously regrettable I don’t see that as a reason not to work with him – if his tips are profitable that’s all that matters when it comes to this service”. Maybe you agree with Matt Houghton on this (I’d be VERY surprised if you did), but I am of the opinion that anybody who conducts their business in such a way is somebody that I wouldn’t really want to be involved with at any level. I am also sure that had this information been more widely known at the launch of The Syndicate, there are a number of people that would have re-thought their decision. Agora Lifestyles claim to bring their customers the “best information and advice on how to save money, make money and improve your lifestyle”. This is an admiral mission statement and if I believed it to be entirely true, then there would be no question of endorsement. The fact is that Agora Lifestyles are firsts and foremost concerned with themselves and their bottom line. Really, the whole Agora Lifestyles team are marketers and this shows in the number of products that they put on people. At the time of writing there are loads of products being sold by Agora Lifestyles both on an affiliate basis as well as their own products. Almost all of these claim to offer you some way or another to make a guaranteed income with very little effort required – where have we heard that one before. A big part of the way that Agora Lifestyles work is by having different arms of the business deal with different topics. For example, The Betting Rant predominantly concerns itself with making money by promoting betting products, both those operated by Matt Houghton et all, as well as products that are marketed on an affiliate basis (meaning that Agora Lifestyles take a cut of the sale price). That doesn’t stop it from offering products from the arm of Agora Lifestyles that deal with Forex trading (where it is often compared to betting, an unfair move in my opinion). As a marketing company, Agora Lifestyles are an undisputed juggernaut and I can easily imagine that they sell thousands, if not tens of thousands, of products each year. This is in part how they are able to employ a team of researchers who are “always on the hunt for new products and services”. What I do find questionable is some of the marketing methods that Agora Lifestyles employ. They will often suggest that certain figures are the norm and this approach is something that Matt Houghton seems to utilise in his own marketing for The Betting Rant. What Products do The Betting Rant Offer? Whilst some of the products that The Betting Rant sell are made up of various bits from other Matt Houghton products, there are now just 3 examples available. I should also point out that the purpose of this article isn’t to go into any depth in terms of reviews of the products either. It is more to look at what sort of thing is made available through The Betting Rant. The first product that I will mention is The Football Investor. This is a compendium of products from Matt Houghton all of which are for, not surprisingly, football bets. This includes his Goal-den Bets self selection system. It also includes tips from Matt Houghton under the title Premier Bets. Arguably the main product that is sold through The Betting Rant is The Syndicate. This is a horse racing tipster service that was initially conceived as having a large number of different tipsters contribute under one brand (something that Matt Houghton has experimented with before in the shape of The Network, a football tipster service that used 5 different tipsters). Unfortuantely, having started with 3 tipsters and having Karl Zanft removed from the product following a seemingly monumental losing season that saw losses hitting at least 60 points. Since then, the stable hasn’t changed and is simply tips provided by Matt Houghton and Miles Tredwell. Matt Houghton has said that this is because The Syndicate is now working, and “if it aint [sic] broke, don’t fix it”. Finally there is a tipster service operated by contributor and winner of the T-Factor, Miles Tredwell. Named The Racing Code, this is a tipster service that provides selections that are supposedly based on a number of different micro systems. As I have mentioned before now, the overall performances from these different services is generally positive. From everything that I have seen, they have all ultimately proven profitable however it is important to note that most of these systems haven’t come cheap (although The Football Investor does represent reasonable value). I have seen The Syndicate being offered for much less than it was when it was launched and this goes some way to justifying it, but as I have mentioned before now, I generally believe that you can find better services for similar prices. So is The Betting Rant any Good? Whether or not The Betting Rant is any good really depends on what it is that you are looking for. If you are looking for general betting advice, reviews and proofing then there are plenty of much better sites out there. If you are looking for opinionated self promotion then The Betting Rant will likely serve your needs very well. There are free tips that are often provided but I can also think of more popular and more profitable free tips that are currently available on the market. As to whether or not The Betting Rant is any “good”, this is a difficult question to answer to be completely honest. Personally, I am not entirely convinced that it is great. There is a lot missing that I look for in a betting website, several of which I have already mentioned. The fact is that if a website like The Betting Rant really wants to deliver then it needs to move away from simply looking at their own products (and ideally replace Matt Houghton with somebody the public actually likes!). This is something that may well be on the cards with a post on the The Betting Rant website introducing a betting product reviewer who has worked on other Agora Lifestyles websites. This is all well and good but given the responses that Matt Houghton tends to give towards criticism to his own products, I can only question how impartial these reviews will be. In fact they are NOT impartial. Moving away from the idea of looking at more external content, even looking at the content relating to their own services I feel that there is rather a lot of basic information lacking. It is fantastic that there are whole members areas dedicated to the services that The Betting Rant offers, however as a potential customer I would like to see things like proofing. These are conspicuous in their absence and given how Matt Houghton seems to like manipulating results in his comments, it does make me question quite what full proofing would look like if it were updated day to day. I don’t believe that Matt Houghton is dishonest by any stretch of the imagination, however I do believe that he falls victim to perhaps seeing some of his products and results through rose tinted glasses. Most of his arguments seem to boil down to “over the last x years, this service has proven profitable” or that “if you factor in x, then it is profitable”. Both of these arguments are valid to some degree and I do think that sometimes, punters tend to get a bit wrapped up in the here and now of a betting system rather than long term results. That having been said, if a customer has subscribed in the middle of a bad run and is losing money, then you have to acknowledge that they are working at a loss. There is also the old staple of the cost of subscribing. This is something that no tipster or betting service provider ever seems to consider, however as a subscriber you are (in the case of some of Matt Houghton’s services) down £495 before you even place a bet. Whilst that is part of business, you can’t ignore that for something to be considered profitable, your customers have to have made that initial investment back. Whilst I may not necessarily agree with Matt Houghton, I don’t believe that he lies about his figures or results at all. There is however (I feel) several examples of results clearly being manipulated. For example, I have already looked at how Matt Houghton has picked out certain dates when talking about the profitability of his service on a proofing website. I also think that the sales material that is put out often exaggerates the abilities and results of his services. This has been called into question a number of times by users and none users alike, only to have the same old arguments thrown at them. There are plenty of betting websites online that actively encourage independent discussion and thoughts on not just their services, but other peoples. They are also less concerned with their “image” and certainly don’t descend into public argument with their customers. Obviously this isn’t all of Matt Houghton or The Betting Rant. These are both multi faceted things. But the issue that I have on a personal level is how much crap do you put up with for the good? The biggest problem that I have with The Betting Rant is that it seems to be mostly concerned with its own products. Comparing the site to other websites related to betting, ranging from huge sites like The Racing Post to small independent tipsters and reviewers who simply maintain a blog, there just isn’t enough talk about the betting world as a whole and that is something that I find very off putting on a personal level. This is just an opinion at this point, but if I am going to conduct business with anybody I would expect them to behave in a professional manner at all times. This is something that I simply can’t say happens all the time with The Betting Rant. The conduct of Matt Houghton just doesn’t gel with what I would expect from a business man (or an employee who represents your business), and whilst I am sure that some of his readers find his “having a bit of banter” approach to things amusing (or at least tolerable), it isn’t for me. In terms of the systems that The Betting Rant puts out, this is a very mixed bag and it is rather difficult to argue that at least some have performed reasonably. That having been said, from everything that I have seen, the long term performance isn’t as good as some other services and given that some of the systems that Matt Houghton is offering through The Betting Rant will run you almost £300 per year, you aren’t exactly looking at a “cheap and cheerful” offering. All things considered, there isn’t really a lot about The Betting Rant that I like. I find that Matt Houghton is antagonistic and argumentative to the point where he just comes across as insulting to his customers and potential clientele. The systems that The Betting Rant puts out I would call passable at best and the actual website itself seems to serve to do nothing more than advertise other Agora Lifestyles products. Whilst this could be overlooked to a degree, I have lost count of the email shots that I have had from Matt Houghton saying that his colleagues have the best and most profitable method of betting, or that you can bet on a sure thing, only to be taken to a product for Forex trading. This seems very duplicitous to me as the two are completely different and require a different skill set. Despite this, the Forex trading products are sold as being an extension of betting. This just doesn’t suggest to me that Matt Houghton has the interests of his customers at heart. Instead, I would say that he is an internet marketer and in this regard, he is very good at what he does. I have already provided examples of not just how he can be selective with statistics for his various products through The Betting Rant, but shows what I would call a disregard for his customers in his other offerings (even on The Betting Rant website home page there is an advert for a spread betting service for sports betting. This has in the small print that you can lose significantly more than they invest). For my money, there are far better websites out there than The Betting Rant in all degrees and I would definitely be looking at these instead. My final thoughts on The Betting Rant are that this is a service that is heavily publicised by one of the biggest publishers of information products online, and as such I would always be somewhat sceptical of the motives of the site. I would also say that having this financial clout behind it makes The Betting Rant look like the biggest, and as many people will think, the best. But there are plenty of examples in the world that demonstrate that this simply isn’t the case. Over the last few weeks More Money Review have announced that they will be closing their website and that The Betting Rant will be taking over all reviews, which is interesting considering one of the very last posts Matt Houghton made was to say he ‘enjoyed poking the hornet’s nest’ against More Money Review members. From what I have seen, I am very surprised that Agora keeps Matt Houghton in their employment. I wouldn’t personally touch anything Matt Houghton offers, advice or product-wise. When somebody who represents your business calls a paying customer an ‘idiotic pick’ the latter word modified in an attempt to disguise the intended slur on the paying customer (as Matt Houghton did to a customer on December) just for questioning the service being received, then you know you are with the wrong company and review website. There is nothing wrong with review sites, obviously, but there should be an etiquette when speaking and dealing with people, especially when the SOLE aim is to push your products. Great review! I always love reading articles that are well-researched and well-written, such as this one – while simultaneously being backed up by facts and actual numbers. I agree whole heartedly about Mr Houghton. Stay well clear a nasty peice of work if I ever saw one, well read. Great review Ben, anything associated to Agora is usually overpriced nonsense. I see no difference between them and Streetwise if I’m honest. I subscribed to a few of Matt Houghton’s ”products” a few years ago, lost money on all of them. A very well written piece Ben, I think you captured the essence of Mr Houghton perfectly, he seems to have become quite bitter as time has passed! Nicely put together and echoes my sentiments entirely, with not only Betting Rant but the much bigger problem of Agora who pass themselves off as being the consumers champion whilst touting over priced and ill researched garbage. Well done. Just came across this (one of my readers said I might like a chuckle). Not got very far down it yet so I’m sure they’ll be more comments – I do hope you respond personally to them. Not being a professional footballer I’m afraid that I have never once in my entire life referred to anything I’ve said as banter. I think I’ve probably used the word bantz or even #bantz to convey my views towards anybody who does use the word banter but that’s about it. Any chance of an example? The Syndicate does not cost £500 a year. That is factually inaccurate so I assume you’ll be updating your review to reflect that? It’s actually £30 a month or £300 a year. Miles’s Four Factor Racing formed part of the Syndicate – he provides exactly the same service as he did before – so, while technically true, the claim that it was quietly closed is pretty misleading. Four Factor Racing members has their subscriptions transferred over to the Syndicate where they received more content for the same (lower) price. Whilst Matt Houghton is saying that the service has been absorbed by The Syndicate, I would argue that this would still mean that the independent service has been closed down. From my research however, there was no mention that this had been the case. I don’t think that the conclusion I reached was an unreasonable one, especially given the fact that the tipping industry quite often has tipsters re-launching their services under different names when one folds. Thanks to the researcher for responding. I can see where confusion may have arisen/opinions may have been formed and I’m glad to have cleared up what happened with that service. As I say, it never closed (not as far as its members were concerned certainly) it was merely added to. While not perfect I was happy with the original service and I’m very happy with the current service. I’d just like to point out that the advert was for a spread betting provider – Spreadex (who also offer fixed odds sports betting) – and not a spread betting system, which is something that I have never promoted. Having said that I don’t personally feel there’s anything wrong with spread betting. Of course there are people who shouldn’t be spread betting but they shouldn’t be doing any other form of betting either. Depending on which way you look at it, you can also lose more than you ‘stake’ when lay betting. Is that excessively dangerous too? Ultimately, I think if you think sports betting is an acceptable pursuit I’m not sure how you can think sports spread betting isn’t. If you don’t dispute the fact Racing Index don’t accept those bets and you don’t dispute, for example, the 1 point @ 50/1 winner. I’m not sure how you can dispute the ‘more money’ claim. I’m all for transparency but when you try to be more transparent by using a site such as Racing Index and then end up getting pilloried for it, it can be a little frustrating. Imagine putting a lot of time and effort into something that makes its members money, then getting told by commenters who were not members of said service (I’m talking about the MMR convo here) that it doesn’t make money. Then pointing at a proofing site that we are holding a prominent position in for the last x months. Then when they pooh pooh that explaining why the figures don’t match up exactly. Then getting accused of manipulation. Thanks for the reply, and considered response, it is appreciated. Yes, we got off to a prickly start, but as I said on another post, text and comments can sometimes come over in a way that means one thing to the writer, but different to the audience. It is an aspect that I am always cautious of when writing, because we both know that certain ‘readers and customers’ will have agendas when writing follow on comments on any type of website/forum that accepts such postings. It is like when I stated that we do not accept antagonistic posts on here, which we don’t, and always left that kind of nonsense to sites like MMR who were well known for trolling, etc. It could be that a large part of some issues some readers could have is with your style. The fact that before MMR closed, your products were talked about in the same vein as being part of Agora, and where trolling was accepted. The bottom line is that we both know a minority of customers will complain about anything, not putting effort in, looking to blame, etc. But some tact sometimes may be needed to diffuse the ‘can of worms’ situations that sometimes happen. So I understand the frustration very well. The review was not meaning to be an attack, and I don’t think it comes across that way, but more on the style of communication, which like I say, due to the way MMR operated, with readers being allowed to troll, this I suspect had a contributing factor on the frustration you mention. I wish you well with Betting Rant, and I suspect many of the trolls will have followed you over from MMR, and are reading, and waiting. Thanks Ben and yes, I pretty much agree with you. I wouldn’t worry about people like that following me over though – the great thing about trolls being on your own site rather than somebody else’s is that you can ban them! Quite a claim. Quite an interesting claim also given you’ve pointed out that my main services are profitable. Any chance of some evidence to back up said claim? You mean that you actually work for Agora, and the reviews mentioned are promoted by Agora, so how can any review you do be impartial, when subsequent sales go to Agora, or a branch of their business. Wrtiting reviews for a company, when you work for the company, and the company own the products or services, or will profit from them cannot be impartial. The Syndicate is proofed to Racing Index. As I pointed out (unfairly it seems according to you) in a conversation on a review site, Racing Index does not accept ante-post bets (of which we had a 50/1 winner last October – something you will be aware of as a (former?) service member), multiple bets or early prices. That isn’t manipulation that’s just fact and easily verified by Racing Index. In the document I sent you, there is conversational transcripts where he makes a claim about the results which are picked apart by another commenter. Matt then goes on to talk about how if you factor in other bets, then you would be right. Given that he goes from making a claim about the position of his service with a website that monitors proofing, only to go on and make amendments to make it fit, I would say that could constitute potential manipulation. Not entirely sure what your issue is with this? The small print is a legal requirement when carrying spread betting adverts. Spreadex – who you are referring to – are a perfectly respectable spread betting website. Are you saying I shouldn’t include the legal small print or that I shouldn’t be promoting a sports betting platform on a sports betting website? Researcher: In regards to his point about the spread betting advert. On a website that deals exclusively with gambling, I feel that it could easily be perceived as irresponsible to advertise a service in which people can lose more than they invest. For every gambler who is in control of their betting, there are plenty who aren’t or there are people in bad financial straits. Whilst I accept that it is not Matt Houghton’s job to police his users, I do think that it is quite clear that from a purely ethical point of view, there exists some grey areas here. Researcher: Building on that last point, the purpose of the statement was not to suggest that he shouldn’t monetise his website, nor was it to call into question the company that he has chosen to use. It was simply to highlight that the advertisement that he carries is for a potentially high risk betting strategy. Screenshot can be provided if required, although I can see from your following message you found the reference. I actually don’t really have a problem with your review bar the points are above. Points which I think are pretty fair but I’m happy to discuss any of them further if you don’t. Some people like you, some people don’t. It’s called the Betting Rant and as such it shouldn’t come as a surprise that it’s aimed at a certain type of audience. There are around 50,000 members of the Betting Rant so clearly that audience is there even if it isn’t for everybody – and if it’s not for you, no problem. There are also points in the above that I agree with, specifically regarding the added commercialisation of the franchise. In general (despite the chuckle mention in my first comment) I’m actually pleasantly surprised by your review. However, as mentioned, I would very much like a response to the points above. Sorry, just reading back through this regarding point seven, I know what you’re referring to now and that word was certainly not ‘modified’ in the way that you’ve claimed. The comment was in reference to an 18/1 shot beaten by a nose… what an idiotic pick. Pick being, quite clearly, another word for selection. It was sarcastic, it was perhaps not to your taste but there is a massive difference between between being sarcastic saying I’m an idiot for picking an 18/1 shot done by a nose and calling somebody else said word. Thank you for spamming the page. The researcher (as you may notice on the page it said & researcher) who also carried out the review will check your claims and then the questions will be answered. Regarding, “that is a lie”, you may wish to check what you have previously written on your own website before making such a statement, as then the subsequent back-tracking does not come across too well after finding you did actually write it. Also, your messages went into the spam section, so please refrain from spamming, if you have a question ask it in a singular post. Wow Ben, that’s a grown up response. I apologise for ‘spamming’ your page. I broke the points up as I felt it would be easier to digest than in one big long post. You may be interested to know that my first post went to moderation – was that, as a singular message, also ‘spam’? There was I thinking that I was merely raising some fair points/exorcising my right to reply. Does that mean the reviews on your website that “sometimes may receive compensation from the companies whose products we review” are also not impartial? I assume so. I didn’t realise I’d said it because you had misrepresented it to such an extent that it was something that I would never have even have considered posting. When something is taken out of context in such a way it can be quite difficult to recognise the comment. Your attitude mentioned in the review is now starting to show in the posts. Regarding this website, we make affiliate commissions on around 20% of posts, and I also provide detailed evidence on my own results on such reviews. I do not own any product on this website myself, and the feedback given from readers, and users suggests that such reviews are appreciated. If you think that is the same as working for a company who provide reviews for their own products via proxy websites, then I can only assume you are missing the point completely. Regarding misrepresentation of what you said, you are starting to try to insult my intelligence. Please note, that although you may wish to be antagonistic on your own website, it will not be allowed here, so if you wish to continue the debate, then I suggest you do so in a respectful manner. I really am trying to be nice Ben. Given some of the things you’ve stated in the review, plus the ‘spam’ jibe I’d say I’m being rather restrained. Appreciate you posting the full comment above for clarity. What I’ve said in response to it is entirely factual. “Yes gaffer, I cut up his new suit and set his shoes on fire but it was just banter”. In your impassioned rallying call against banter I’m pretty sure that was the sort of thing you were referring to rather than some generic blurb in the ‘about us’ section but do correct me if I’m wrong. I could say more or less the exact same thing about my website. What I should also say is that the reviews from my website are imported over from More Money Review. I’ve instructed my reviewer (who works freelance by the way) to not review any of my stuff going forward as it will always attract accusations irrespective of whether they are well founded or not. It was not a ‘spam jibe’, it was a fact that due to you posting so many comments in quick succession the subsequent posts went into spam based on the filters administered on the website. Regarding the banter comment, you asked for an example of where you portrayed the participation of your website as banter and this was provided. Regarding the costing of the service mentioned my reviewer was referencing an earlier email sent from MMR, which he no longer has and therefore, the price point in the review will be changed. I also feel how you can now see that using your own reviewer to review your own products can be seen as self conflict, which as you say, you have now instructed otherwise. I can see how it would be seen as self conflict but that does not mean it can’t be impartial. It is entirely possible for somebody to produce an impartial review in those circumstances. It isn’t me writing these reviews, it is a freelance reviewer who has reviewed thousands of services from many vendors over many years. My issue was with your specific statement that they ARE NOT impartial. Had it said something like “there could appear to be a conflict of interests her or a question over impartiality” I wouldn’t have had a problem with it. As I’ve said, I’m not trying to be antagonising, just making a few reasonable points. I’m fully aware I can be a bit snappy sometimes but I’m sure you’re also aware that “Thank you for spamming the page” is not without sarcasm. Thank you for changing the price point of the Syndicate. I’m also still interested to hear why including the legally required disclaimer on an advert for a respected sports betting platform is being portrayed as shady in any way. I think we both know how words can be, shall we say, manipulated to echo different meanings, and similarly, words can be read in that same fashion when the initial meaning was not there. Regarding the other points, I personally didn’t research them, but the researcher who did has already written in a Word file the reasoning behind his points, which I will add over the next 24 hours. I am a little busy today, but just quickly glossing over it, there are answers given. Thanks for the response Ben.I think we understand each other a bit better now – certainly than after the initial flurry. I’ve no problem with the general opinions in the review even if I don’t agree with some of them. Opinions are just that and everyone is entitled to them. I just feel that in certain areas the review sounds less than, well to use a buzz word, impartial! I’ll wait to see the addition anyway. Very interesting review, thanks for the info, I have had a few offers as I must be on their mailing lists from way back. The name betting RANT suggests that Matt enjoys ranting so at least he is honest about one thing. He is probably just another coward who if you met in real life would soil his trousers. I have not used the Syndicate but have been a paying member of the football service that is primarily “The Goalden Formula” along with the odd international acca. There are also antepost bets at the beginning of each season. Last season after the entire season between antepost and in season bets it was a loss. Factoring in membership (paid 2 years up front) an even bigger loss. Unless this current season hits an absolute stormer for the end as well as landing multiple big odd anteposts it too will be a loss. My advice, avoid this service like the plague. If it can’t even break even after 2 seasons it’s trash! Please does anyone how to cancel an order for subscription on betting rant?